One day we went to the North Sea! I was so excited…Norway is on the North Sea! My mother is full-blooded Norwegian, my great-great grandparents came to America from Norway! But when we got to the North Sea we couldn’t see across it, it’s too big! And that’s as close as I’ve ever gotten to Norway! On the way we stopped at Breskens. 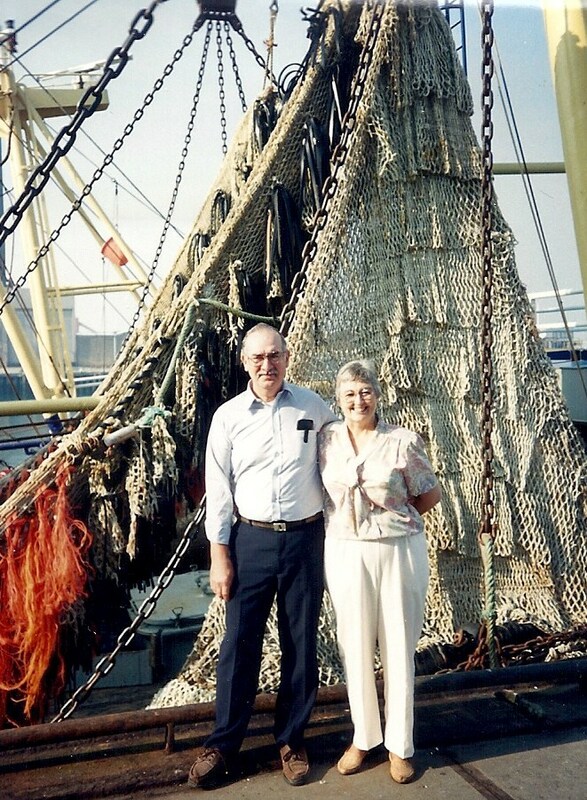 This picture is of Jerry and me beside a shrimp boat! 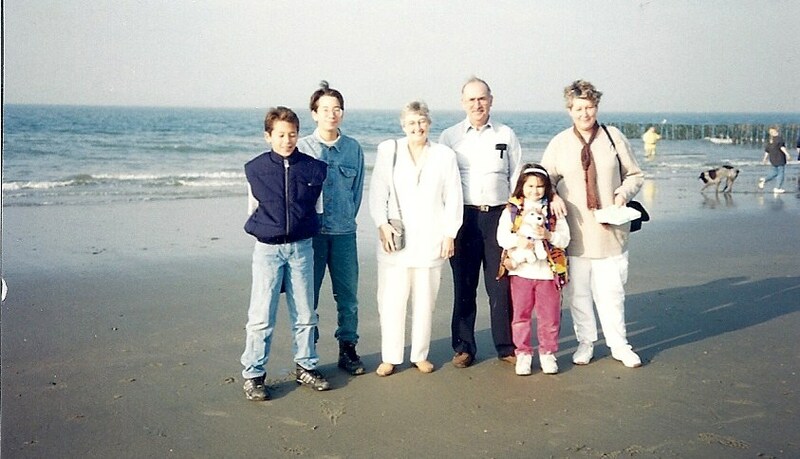 Then there’s a picture of us with our friends who took us to the North Sea. The beautiful North Sea is behind us, Dirk, Tom, myself and Jerry, Lettika and Anja. Henk took the picture. It was a chilly, blustery day. But we were warm with friendship on the inside. We had a wonderful day with our friends and it was exciting just to be at the North Sea. This entry was posted in Europe, Friends, North Sea, The Netherlands, Traveling and tagged Europe, North Sea, The Netherlands, Travel, World. Bookmark the permalink. Enjoying reading about the places you’ve visited. It would be good to know what years you visited each of them. Hi Sue. Thanks for your comment. I probably haven’t been clear. This is all our one trip to the Netherlands in 1994. It’s too long to put in one blog so I’m doing it in parts. The next part, #6, will be our day in Haarlem at the ten Boom Clock Shop and the Hiding Place. What a lovely looking beach, even on a blustery, cool day. I needed to put you this very small observation to be able to say thank you once again on your amazing basics you’ve contributed above. This is really tremendously open-handed with you to convey easily precisely what a number of people could possibly have sold as an ebook to help with making some dough on their own, specifically considering that you could have tried it if you ever desired. The advice likewise worked to become fantastic way to realize that many people have the identical dreams the same as mine to grasp more regarding this problem. I think there are some more pleasant instances in the future for individuals who browse through your blog post. I am lucky that I found this website, precisely the right information that I was looking for!